Reviews with ♡♡♡♡♡ independently collected by Stayz & Take a Break. Whaleback Cottage – opened May 2014. Tor Cottage – opened July 2009, renovated Sept 2014. Sorry, Tor Cottage no longer has a spa. The Shearing Shed – opened 2009, closed 2012. We decided to live in it instead. Thank you for a memorable stay. We enjoyed a lot. Hope to come again. With love & regards. I LOVE this place. You have created something truly beautiful and fitting amongst this powerful granite country. Thank yo. It is a treasure. Beautifully and thoughtfully appointed. Many thanks for welcoming my hounds. Much appreciated. We will be back. Thank you! Your cottage is absolutely beautiful, stunning design. I love the shower – I seriously LOVE IT – the stone & timber & shower head combo is just perfect. The product range you have selected is divine. All the craftsmanship is outstanding and I adore the celtic influence, again beautiful. We had an amazing honeymoon. PERFECT. Thankyou. There are so many great things to say about our stay in Whaleback Cottage. The cottage itself is a little bit rustic but at the same time very modern and comfortable. It is really we set up with everything from cutlery through to condiments and tea and coffee better than most places. It’s private but also very accessible with great views just half a minute away. The walks are great. Very well marked and the topo map provided has the tracks marked really well. It would be very hard to get lost. The scenery, wildlife and views make for a very enjoyable times and we’ve been able to get some great photos. We can highly recommend this place for a stress-free getaway. We (1 couple + dog) stopped off at Tor Cottage for 2 nights on the long drive back to Sydney for FNQ and so glad we did so. As you can see from the pictures the building is located on a rocky outcrop on a hill overlooking the owners property. We were met upon arrival by the owner and directed to the cottage. We drove the further couple of hundred metres to the cottage and were blown away by the view, the location and the quality of the structure. Sitting in the spa as the sunset over the farm was so relaxing. The next day we explored the property on an exhausting 3 hour hike. We loved this place. It was peaceful,serene,extremely comfortable, private and on our return wish list. We absolutely loved our time up there! Being able to see the stars from the spa but still be sheltered from the cold was the best. Loved the walk via Kissing Rock and Boulder Springs. I’d recommend any visitors at least trek up to Kissing Rock, just between there and the cottage we saw a lyrebird and a flock of yellow tailed black cockatoos. It has been a long while since I’ve been able to take a midday nap, but after our walk we enjoyed some champagne and nibbles on the deck and afterwards I fell asleep in the warmth of the sun, it was bliss. Beautiful location. Quiet and away from all the noise. Comfortable living space all in all a wondering and relaxing getaway. We were well provided for, never running out of wood to keep the fire going and easy to understand instructions. Thank you for a wonderful holiday! So peaceful & relaxing, you feel as though you are a million miles from anywhere. Our doggy loved the walking tracks and snuggling by the warm fire. Great shower, great to have a well-stocked kitchen. Highlight: sunset & stars!! Thanks so much, it has been beautiful. Fabulous place! Wonderful location – great introduction to Aussie bush landscape, roos included, for someone on their first visit from UK. The views are amazing. Who needs TV when you can watch such amazing sunsets and listen to amazing birdsong. Kissing Rock is a hidden wonder. Anketell Forest and its valleys are indeed a treasure and it is a must for visitors to make the effort to walk the trails as there is a picture around every bend. The ‘twitching’ list was great and proved to be a good tool. Thank you for helping make our Christmas a delight! Love the cottage and surroundings. Beautiful sunsets, very good trail walks. Peaceful & relaxing. We stepped inside & we don’t want to leave. Absolutely amazing! The views, the sunset, the peace, quiet & tranquility take your breath away! Absolutely beautiful, I believe we have found our home away from home. Thank you, we’ll be back. This is a truly wonderful well-appointed cottage in a magnificent setting. To have been able to take a walk in the natural surroundings, accompanied by ‘roos & kookaburras & to return to a relaxing spa in, by then, a chilly evening was luxury indeed. We were delighted to have such a variety of teas and coffees to warm us in the evenings and mornings and it was lovely to watch the early sun creep onto the deck. We had the most enjoyable stay in Tor Cottage. Loved all the walks. Loop ‘A’ we thought the best. The position of the cottage is very private, peaceful & quiet. We hope to come back and walk Loop ‘B’ again as we missed the track to Eagle Rock. We found the cottage had everything we needed. Thank you very much. Really loved the short stay we had. Will be back again for a longer stay. Loved the peace and quiet. Will let all our friends know how beautiful this place is. Ü Thank you. Perfect 4 day holiday with our puppies – Murph & Maisie. Being our first family holiday together this was the perfect place to come! Cold mornings, blue sky days, even rainy day spent inside watching DVD & keeping warm by the fire. Ended of each day with a spa and watching the clouds roll by with a wine at the bar. We aimed for a sunset photo )canvas print for our home as a reminder of our holiday) but didn’t get it so we will have to be back again. Thanks for sharing your perfect spot & great cabin. Love it. So jealous. This is our second visit to the cottage and we have enjoyed it as much as we did before. The night sky here is incredible. We set up a digital SLR and captured an 8hr time-lapse of the milky-way moving through the sky. The wood-fire and hot spa made for a very cozy atmosphere. Thank you for the tea provided the rain drinking water and constant supply of firewood. This is our second visit to the cottage and we have enjoyed it as much as we did before. This time we explored Anketell Forest and found an amazing outcrop of granite where we enjoyed spectacular views and a packed lunch. Will be back again. This place is sooo well thought out. Lighting is great, lots of hanging space, kitchen is small but very functional. BBQ area is excellent and I would prepare meals on the bench outside and admire the scenery! Spa has great ventilation and towel racks in front of the fire ensure quick drying. Absolutely love it … don’t change a thing! We’ll be back! Once again we had an amazing stay, so peaceful and relaxing. Thank you. Stunning, surreal, perfect, absolute magic! Everything about this place from the surrounding bush, the craftsmanship that has gone into the cottage, the service is just beyond words. The love and craftsmanship is felt throughout the cottage. There is no other like it. Thank you so very much. The cottage is cosy & comfy & provides everything you need, plus a few nice little extras. The views are superb and the location of the cottage and property provide a great base for exploring the New England region. We really enjoyed our stay and hope to return again soon. Thank you for a lovely few days. Tor Cottage is delightful. So peaceful and scrupulously clean. We really enjoyed our stay despite the grey skies. Our 4 legged friend Harri loved it too. He was particularly impressed with the rabbits, roos and farmyard animal smells. Don’t change a thing. Perfect as is! See you again soon! The Good: Arriving in the pouring rain to a warm, dry cottage with fire ready to go; well stocked plus more; peaceful & private; easy access; beautiful setting; gorgeous cottage; bird heaven. The Bad: Had to leave; didn’t get flooded in. Our main reason for coming to the Tenterfield region was to climb Bald Rock. We were attracted to Anketell Forest mainly for the walks that were offered on the property. We weren’t disappointed! We saw a Superb Lyrebird which is a real highlight for us ‘birders’. The walk to Kissing Rock was impressive and we really enjoyed the other walks we did. Tor Cottage was very cozy and comfy. Thanks! We loved our stay in your perfect country hide-out. Spotless throughout, comfy bed and great hand made fittings. Hope to be back soon! RELAXED RELAXED RELAXED! Peace, quiet, rest, tranquility. The remoteness of Tor Cottage provides all of these in abundance. We loved the bushwalks on the clearly defined trails and enjoyed the rugged beauty in doing so. The rustic little cottage was comfortable and well equipped and the large outdoor deck area was a great place to relax and enjoy eating dinner as the sun set. We greatly enjoyed our time here. Would like to come again, perhaps a winter visit – imagine it would be beautiful in a different way then. Thankyou. Serenity Wow. Isolated, tranquil and peaceful. Lovely place. Would recommend. This is one of the most amazing places. tranquil, private and relaxing. You can be energetic and go walking or just lay around and relax. Thank you for a lovely stay at the Cottage. We loved it and really were sad to leave – 6 days was not enough. We loved the cosy, homey feeling of the cottage, the ever changing views from the deck, the walks in the forest, the sound of nature to wake up to, and fall asleep on. Cycling in the area was great too! Lots of endless gravel roads with hardly any cars through farmland and nature reserves. We will mention your place for anyone looking for a little paradise. Five days relaxing in the seclusion of Anketell Forest is a great way to unwind. Tor Cottage is well set-up and the handmade timber furniture and interior fittings add to the ambience. – watching the changing view from the deck … while drinking a beer. – bushwalking & seeing wildlife. The “essentials” were well set up – range of teas etc, real milk. Enjoyed the mix of DVD & CD. Peter especially enjoyed the read about Bolivia Station (even though he usually doesn’t read). LOVE the cottage and setting. So quiet & Peaceful. Thank you so much for sharing for just a little while. – Desleigh. Fantastic again! Great walking, lots of peace & quiet, lots of animals to see and such a comfy cabin. I find it very hard to leave! Thank you. We love how Tor Cottage is set high on a hill and incorporated into the amazing granite rocks that are so much a part of the landscape here. Eco-friendly with furniture built on the property by Steve and quality inclusions. We had an utterly private relaxing three days and enjoyed our bush walks and bird watching. Simply said, paradise. From many aspects – practical as well as romantic. First, the website. Lots of useful info down to details like, not only self contained but with the list what exactly is included in the kitchen. Brilliant. Then when arriving friendly hosts are always available with advice about area. Cottage is situated with some distance from main house, closer to workshop where during the day you can hear working noise but not too disturbing. Beautiful view from the terrace. Inside cottage- Huge, comfortable bed, tv/dvd with impressive library of dvds and books which should suit almost everyone. There is also sofa to rest and outside daybed on the terrace. The huge property is amazing. Living in Queensland we rarely get to see that sort of landscape. We went to the region to fossick, but spent lots of time walking around and exploring the property. Our dogs had an absolute ball too. We really enjoyed our stay. The fire was amazing. Thank you for continuously supplying us with timber. The cottage is beautiful and it is a credit to both of you. Thank you for a wonderful stay. We have enjoyed Tor Cottage immensely. Very romantic with the fireplace, spa and bed all in the same room. It has been a great place to come ‘home’ to as it is quite central for exploring the area. This has been a part honeymoon for us and it has been a delight. Thank you. PS: we saw the new cottage being built. Looks amazing! Location, location location! Says it all! The rock art creativity by other guest was inspirational – loved all the cairns – had fun leaving my ‘monument’. Real coffee is a great treat in accommodation. Thank you for your Anketell Forest body products – very nice. What an amazingly beautiful, tranquil and relaxing place. Gorgeous facility, fantastic cottage and amenities and the view, wow! I have so enjoyed my stay here. The Cottage had everything I needed and more. The walking is fantastic and most of all the sense of being far away from everything and everyone was so wonderful. I’ll be back again when it gets colder! We had the most wonderful relaxing 3 days. The cottage is so comfortable and the view from the deck is fantastic. It was so nice to bring our dog Beau and feel so safe and secure He loved wandering around the property with us. The privacy is great and once here you don’t want to leave. We will be back! “We have been close to heaven these past 2 days and that confirms my husband’s incessant research into “holiday”/travel accommodation in every corner of the world. He’s very good at this endeavour). We have both needed the sounds and sights of peaceful and tranquil environment… it is about 7pm and we are truly blessed by no other sounds than those whose environment we are (temporarily) invading! Your accommodation is superb … nothing needed other than some coffee, wine & food. Thanks! “Stayed for a night for some long over-due recharging! What a perfect isolated spot! Attention to detail was fantastic… everything I needed was here. “We had a lovely time! It was a peaceful relaxing weekend and had everything here that we needed. From books to films to music. The spa bath was awesome. Loved it! “A magical place to stay and get away from it all. A very comfortable, stylish cabin with everything we needed. Thank you, we’ll be back. “Lovely setting – very relaxing. Perfect! “A magical setting for relaxation of mind and body. The Cottage and furniture a testament to Steve’s superb woodworking skills. Wonderful to have a ‘pet friendly’ environment to stay in on top of the world so close to nature. We enjoyed our stay immensely and our Bigpond mobile and laptop worked! “Wonderful to sit on the deck of Tor Cottage and watch the sun set over the hills. Thank you for picking such a great site! “Magic place you have here! Comfy bed allowed for deep sweet dreams and we watched a dvd from the spa last night. Perfect! “It was great to be able to take my cats to such a quiet secluded place. The Cottage was very comfortable and relaxing. The highlight was seeing the stars from the spa. All was great. “Thanks for a lovely relaxing stay in your Cottage! We had a lovely time. Saw a lyrebird this morning near the bottlebrush lined gully. We will be back! “Loved it! Beautiful little dwelling. The dogs have never been more relaxed on holiday. It’s a beautiful spot. “Just wanted to drop you a line to let you know we thoroughly enjoyed our stay in Tor Cottage on Tuesday night. It’s a great little spot you have down there and Tor Cottage has everything we could ask for in our getaway. We were a little unsure if we should light the fire that night as it was quite warm early on. We are glad we did though as it was a fresh morning. We also loved laying outside and gazing up at the stars!! It is amazing how much clearer things are away from the city! The dogs had a great time there as well. 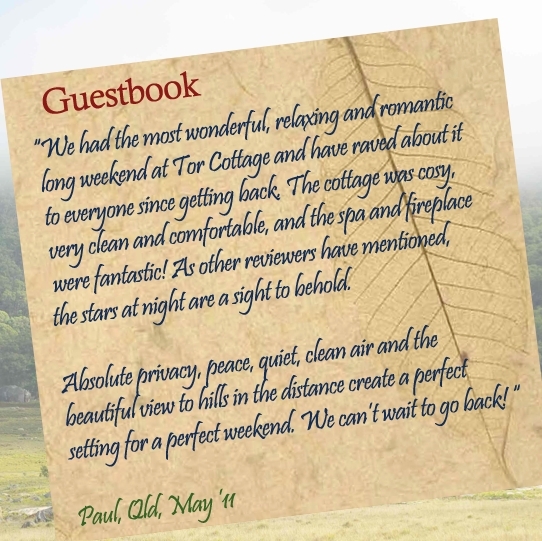 “Our stay at ‘Tor Cottage’ was an experience that we will never forget. Amongst the tranquillity and peace, the wildlife and scenery, we experienced a relaxation like no other. The stars at night were like diamonds, you could pluck them out of the sky they seemed so close and so many. We had privacy, comfort and rest which is what we needed. Tor Cottage is the most snuggle place I have been to and we do holiday in a lot of retreat places. It is so well built with the organisation of everything you need, the woodwork is fantastic. Our dogs Zeus and Roxy had the best holiday ever Zeus thinks he is a Dingo now from running around the bush. I am sure they miss it too I have never seen them play so much together. “Arriving under a star-filled sky, we entered the wonderfully inviting, secluded cottage, and were instantly charmed by it’s roaring fire. The quiet bush setting, along with it’s great vista, was just as we might have hoped, topped off with a feeling of privacy that’s often lost when looking to get away. Walks in the surrounding bush revealed impressive granite boulders, beautiful wildflowers, towering gums and birdlife all around. “Really lovely place. So peaceful. We enjoyed it very much, thank you. “Just a quick note to say thank you so much for an absolutely fantastic weekend. It was a perfect “Valentine’s Day” Escape. We had the best time, so quiet and secluded – time to just be together. We enjoyed our walks, loved the spa; lunch and breakfast on the deck, glass of wine while we watched the sunset – and Tyson (the puppy) had the best time of all – he ran for miles and slept like a log at night. We had a beautiful time here in your beautiful cottage.This place was a great find! It’s very peaceful here and we’ve really been able to relax. Thanks for your wonderful hospitality. “We stayed for three nights with our spoilt rottie-xxs and they gave the place the paws up. It’s not often that you get access to beautiful natural bushland with wildlife and wild flowers and share the experience with your faithful hounds. We walked Anketell for hours and the dogs never tired of sniffing for scents and staring in amazement at the huge walleroos. Late afternoons were spent on the decking surveying the big horizon and watching the sun set with a few home brews to mellow out the day.. We thoroughly enjoyed the lack of TV and mobile coverage and fell asleep to the sounds of silence disturbed only by the crickets.